Journaling has always been fun for me. There's something therapeutic about getting my words out on paper. It's almost like a release. Then there have been other journals that I've created in order to preserve precious memories after my son was born. While it may not always be easy to sit and create long journal entries every single day, I try make a good effort to jot down those special moments. 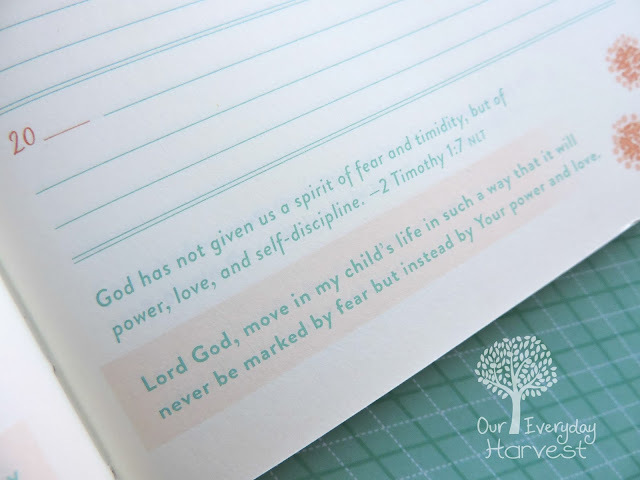 When I saw that a new journal for mothers was being released by the creators over at Thomas Nelson, I was immediately intrigued. Right now, my writing is done in a special notebook, and while nothing can replace this book, I really wanted to see what this journal had to offer. 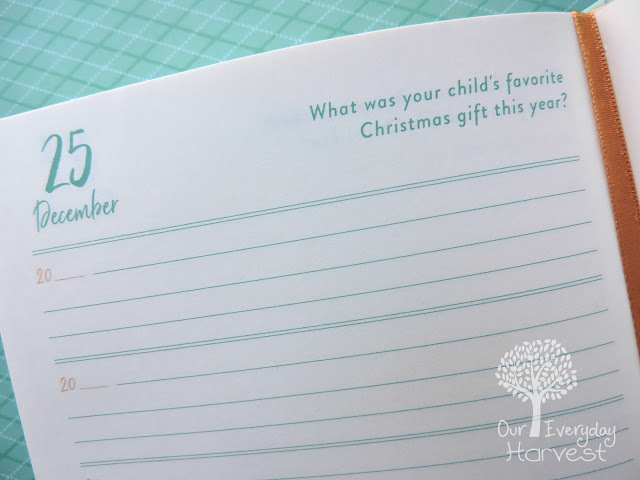 Just one simple thought a day to preserve five years of memories with your children—finally, a record book that is doable! 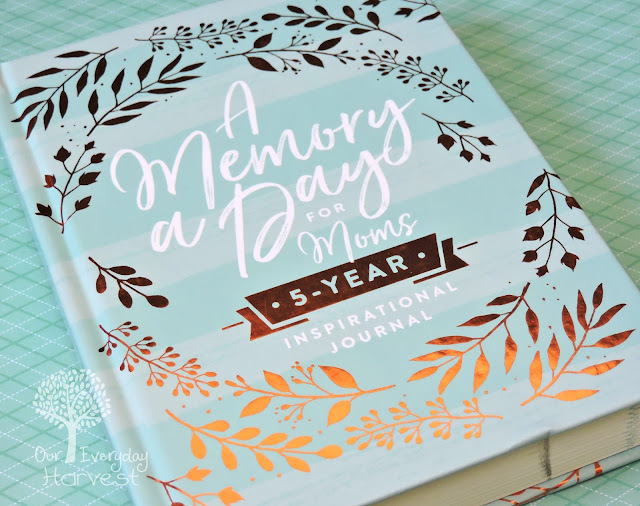 A Memory a Day for Moms,a beautiful five-year journal with carefully curated questions and writing prompts, offers you just that. 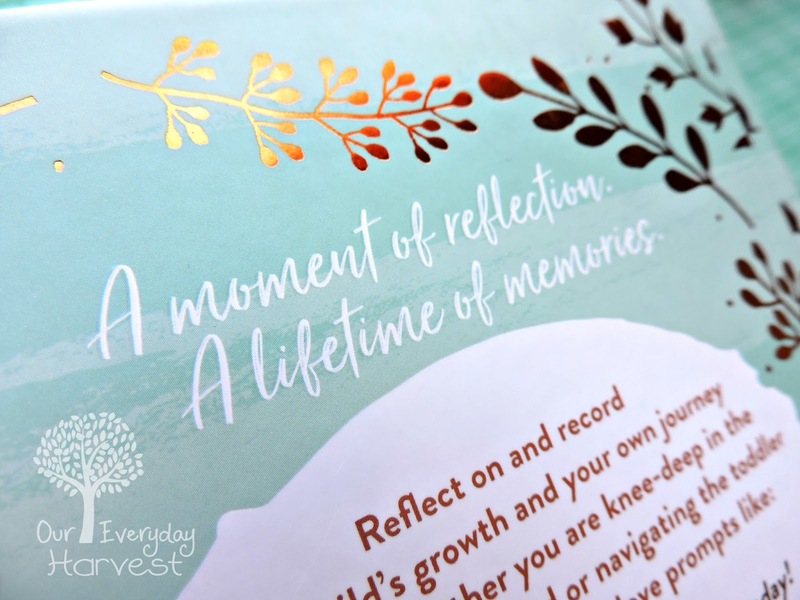 Jot down a single thought, memory, or prayer, and build a treasured keepsake day by day. Mothers in all stages of life will find something to love about A Memory a Day for Moms, as it allows you to reflect on and record your children’s growth and your own journey as a mom. Whether you are knee-deep with littles or navigating the tricky waters of high school and beyond, prompts such as “My child said the funniest thing today!” “My hope for my child is,” and “Lately we’ve been enjoying _____ together” will always resonate. A Memory a Day for Moms offers a unique design approach to the typical everyday journaling experience. Rather than pages upon pages of blank lines to jot down whatever it is that's on your mind, there are daily prompts in set in order by calendar date (January 1st through December 31st). The prompts offer fun and heartfelt ideas on what to write on any one given day. Some of these prompts includes questions like, "What are you hopeful about right now?" or "How have you seen God's love at work in your life this week?" As you can tell from the last question there, this journal is offered from a Christian worldview, which I especially enjoy. The bottom of each journaling page also includes a special scripture verse and a small two to three line prayer to recite. Since this is also a mother's journal there are plenty of writing prompts that focus on my child. This is one of the features that really enticed me about this particular book. Some of the daily writing prompts include, "What adjective would you use to describe your child, today?" and "What's the silliest thing you've done with your children, lately?" 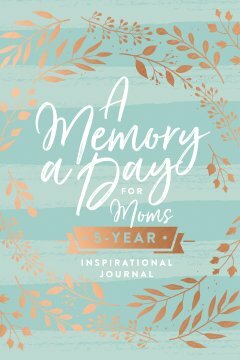 This journal definitely offers a happy mix of day to day reflections, some focusing on me as a woman and mother, while other days focus on my child, and even the entire family as whole, including my husband. One other unique design feature is the way each daily entry page is set up. 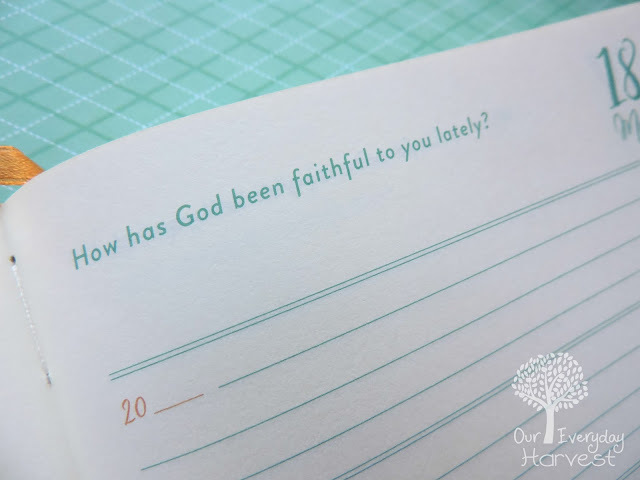 Every day offers five separate sections for five different years of journaling. Since the pages are not very large for each date, there aren't many lines to complete the entry–in fact there's only four lines for each date (spanning through five years). There is a year notation next to each journal space (five on each page) that begins with "20." The writer can then fill in the next two digits on the blank line depending on the current year they are writing in. Some may or may not appreciate the short amount of space left for daily journaling entries, but that will depend on how much you like to write, as well as other factors. Since I personally already own a journaling notebook, which I use for my longer entries, I definitely appreciate the small amount of lines coupled with the daily writing prompt. To me, this type of journal design serves more like a memory book rather than a full-fledged journal. I appreciate being able to keep up with special moments, even just jotting down the small ones that still mean so much (a quick memory here and there). Another plus about this specific feature is that you are using the same writing prompt on the same date, each year. This means that you can see how things have changed or progressed one year to the next (using the same topic), which is especially nice for preserving various moments in my son's life. I also like that the creators kept special holidays in mind like Thanksgiving and Christmas, adding themed topics to write about for these specific times of the year. A Memory a Day for Moms is also a very beautiful book. It has a pastel teal color theme throughout with gold embellishments on the exterior cover. Inside illustrations shows simple, yet pretty orange and teal flowers. There is also a pretty gold ribbon bookmark sewn in. With mothers in mind, this journal definitely offers a soft, feminine design. I love being able to jot down special memories, not just about my life, but also in my child's life as a young boy, as well. I want him to be able to open this up when he is older and read all about the fun memories we had when he was little, some that he may not even remember. A Memory a Day for Moms is a wonderful way to share some of those precious moments in our lives and the lives of our children. This is going to be a beautiful treasured keepsake for my entire family.